We don't know how many of you guys embrace the idea of having a stylus, but it seems the stylus, which is going through a small renaissance at the moment, isn't going anywhere. It just became known that Samsung has bought 5% of Wacom - the makers of one of the best designer tablets out there (not touchscreen tablet, but tablets used for drawing). These 5% are equal to an investment of $58.2 million, so no major bucks have gone into this. Still, this deal serves as an obvious proof that Samsung will continue to equip some of its devices with these sweet Wacom-powered styluses. The cool thing about these gadgets, and the thing that differentiates them from those simple sticks of past times, is that they are now pressure sensitive and can be used for drawing and other productive work. We're glad that Samsung is enhancing this technology and isn't just loading ordinary styluses into its products. Speaking of products, there have been some rumors hinting that the Galaxy S IV smartphone, expected to get announce in late April or early May will have a stylus, but we wouldn't be too sure about this yet. What's more probable, though, is that Samsung will continue to equip its expanding Note line with styluses. I have my first experience with S-Pen yesterday and it was a great leap to stylus technology! I thought it was just a simple stylus but heck no! I liked how Samsung utilizes the stylus. PA :"What's more probable, though, is that Samsung will continue to equip its expanding Note line with styluses." .. oh really..dat was a tough prediction!!! I feel like it be a smart move to give people the choice. A 4.7-5in phone with the s pen would bring in more potential buyers. Good to see Samsung reinvesting those profit into other companies building allies. I think I expected too much for the stylus... 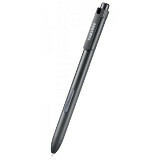 I was rather a bit disappointed with the stylus on my Note 10.1.